Spinner II centrifuges have provided exceptional oil-cleaning performance and improved engine reliability for more than two million diesel engines worldwide. They have been installed as standard equipment by more than 40 engine manufacturers, including Alco, Caterpillar, Cummins, Detroit Diesel, EMD, General Electric, Mack, Navistar, Waukesha, White Superior, and many others. Spinner II oil-cleaning centrifuges may be specified on new equipment or easily installed on existing engines. A Spinner II centrifuge has up to 10 times the debris-holding capacity of even the best filters. So it stays on the job longer. And because the centrifuge removes contaminants from the oil stream—instead of accumulating them in the oil or on a filter surface—there’s less to plug. Cleaning efficiency remains constant over the entire service interval. In addition, the Spinner ll is a Green product—with no EPA requirements for contaminant disposal. Cleaner lube oil reduces the contaminants trapped in the engine’s main oil filter(s). Keep in mind that service intervals vary by application, engine duty cycle and other factors. Spinner II recommends that you consult with your lube oil supplier, engine manufacturer or distributor and lube oil testing service before making any decisions about extending oil drains. Regardless of how often you change your oil, you won’t have to service your Spinner II centrifuge as often as you change ordinary filters. In many applications, Spinner II centrifuges remain in service for a year or more. That’s because there’s no clogged filter media to clean or replace. Instead, the Spinner II centrifuge removes contaminants and stores them away from the oil stream in a high-capacity, cleanable bowl. Actual service intervals will vary with duty cycle. The Spinner II centrifuge is a highly efficient bypass filtration device. It diverts a small side stream of oil for processing and returns clean oil to the crankcase. Powered only by engine oil pressure, the centrifuge operates at speeds in excess of 6,000 rpm, generating a force more than 2,000 times greater than gravity. This force slings contaminants smaller than one micron out of your oil and packs them into a dense cake on the wall of the cleanable centrifuge bowl. 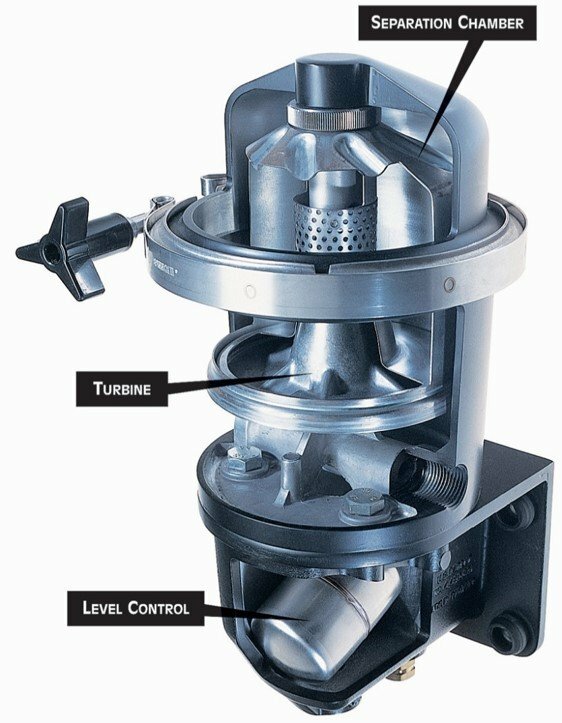 A Spinner II centrifuge flows up to two gallons of oil every minute, allowing it to clean the entire sump capacity of a typical heavy-duty engine 10-15 times an hour. Spinner II is a registered trademark of TF Hudgins, Inc.
As of January 1, 2018, new diesel engines over 174 horsepower used in mobile application must now meet Environment Canada and EPA Tier 4 Final regulations. If you are currently running a John Deere engine, you have options. Trying to make meaningful comparisons between engine types can be confusing. This is one of our most popular articles and has been read by hundreds of people. We usually think of an industrial engine as a freestanding “power unit” that can be used in a variety of applications. We design and build power units for many different customers. Engines designed for low emissions while meeting the same durability standards as Kubota’s diesel engines. Our primary engine suppliers—John Deere, Kubota, Mitsubishi and GE—all offer engines that are optimized for power generation purposes. From pump drives to planetary drives, check out Funk’s drivetrain components. Kohler Power Systems has developed a line of spark ignited natural gas/propane fueled generator sets designed for continuous, prime or standby applications. Kohler is able to provide custom, turnkey solutions including switchgear and remote monitoring. We are a proud distributor of Transfluid’s powertrain products in Western Canada. We are a proud distributor of Hayes Manufacturing’s power transmission products in Western Canada. If your existing engine is tired or down, we can supply you with a cost effective replacement package for existing John Deere powered or other non-John Deere powered OEM equipment. Extend the life of your equipment and improve its trade-in or resale value by repowering with a John Deere Reman replacement engine. Published by John Deere and highlights innovative uses of John Deere engines. Frontier’s customers are regularly featured.